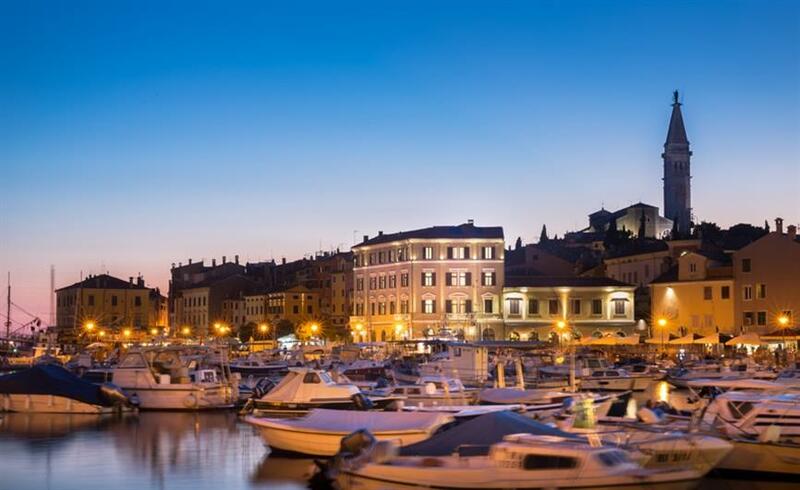 Hotel Adriatic is a key part of the tourist postcard of one of the most picturesque Adriatic towns. For many years the hotel slowly decayed, but after renovation became the heart and pride of Rovinj city centre and its inhabitants. The hotel was built in 1892 and was initially a café, and from 1913 a hotel. After intensive renovation carried out by Maistra, the building shone in the spirit of heritage and perfectly complements the cityscape. Today, this is the only city hotel that, thanks to the courage and vision of the investors, embodies the idea of a boutique city hotel. Rovinj is most easily accessible by car. Such guests are well catered for because the hotel has its own parking space, and an electric vehicle takes you to the hotel in the city centre. Guests appreciate the retro urban bikes that are included in the price of their stay and which work well on the coastal streets and trails. The advantage of the city centre location is the accessibility of all the main tourist attractions of the picturesque town. In recent years air accessibility through the nearby airport in Pula has also considerably improved. There are also international airports nearby in Trieste, Zagreb and Ljubljana. Credit for the design of the hotel goes to the awarded 3LHD architectural studio. Together with many project partners, they managed to preserve original details. With more than 100 works of art, the hotel is simultaneously a gallery, as installations, graphics and paintings are found throughout the premises. Some 14 regional artists have been hired for the art works, including Jasmina Cibic, born in Slovenia and now working in London. Cibic has taken care of one of the most recognisable installations (also most frequently photographed for Instagram) of Adriatic – the battered white owls in flight, which are supposed to represent the movement between the glorious past and the unknown future. The whole works luxuriously, eclectically and elegantly, full of various textures and cool tones as well as experimenting with light that makes up the whole. Andrew Gaskin, an experienced British chef, keeps a vigilant eye on the menus of Maistra. His Mediterranean style is felt on the plates of the Adriatic’s “brasserie”. The emphasis is on seafood, and Mediterranean dishes. The boutique story continues at breakfast, served in a café atmosphere, and the breakfast is one of the best on the Adriatic. It is worth mentioning the unique chic staff uniforms, which are designed by the leading Croatian fashion brand Studio I-GLE. The uniforms also combine classic with modern guidelines. In the culinary field, a large variety of whiskeys, served within the rules, is a great deal. The selection ranges from Japanese Suntory to a wide range of Scottish whiskeys for connoisseurs. Morning macchiato on the hotel terrace easily matches up to the Italian competition. Retro bikes to take you to one of Maistra’s designer hotels in Rovinj or to your favourite corner of the beach. Especially outside of season, cycling along the well-marked paths offers true relaxation. We did not come across any negative surprises during the visit. Tiny design details that are unique, thoughtful and inspiring. The idea of a book of personal impressions in each room is lovely, and the usual room equipment with great design, inscriptions and execution bring a smile to your face. Hotel Adriatic is synonymous with a modern boutique design hotel with an excellent restaurant and a very well-stocked hotel bar. The hotel is an excellent base for various programmes in Istria. Among these we are especially fond of the wine story in inland Istrian, where you will find some exceptional winemakers (Kozlovič, Roxanich, Matošević, Kabola …) and excellent taverns (Morgan, Buščina …). The hotel is suitable for smaller, more demanding incentive groups, that will combine various services provided on site by Maistra. This complex includes several meeting rooms in the premises of the former cigarette factory and the meetings centre at the Lone Hotel. An excellent, if not a top boutique hotel that will impress you and your meeting guests. EXTRAS The hotel is a unique gallery where you will find the works of many artists which will enrich your incentive experience.